On the morning of March 20th 2015 a combination of some of the most beautiful occurrences within the celestial calendar will all occur. 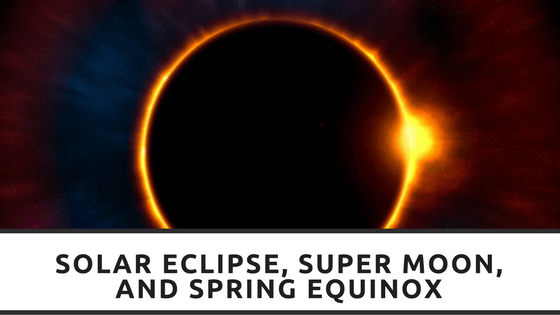 Not only an Eclipse but a Super Moon and the Spring Equinox will befall this Friday. What follows is some facts regarding the 3 events and a little history. Solar Eclipses often happen between 2-5 times a year and for 2015 a Full Solar Eclipse is on March 20th and a Partial Solar Eclipse is on September 13th. The Eclipse on Friday 20th March, a time in which ­the Moon obscures the view of the Sun, will be seen at its greatest over Scotland. The further north and west you go the better the view of the Eclipse. Europe, North Africa and Asia will also get a good partial view of the Eclipse. Eclipses have always held a position in history as omens or portents, with many believing the Eclipses carry some warning or message from a higher being, for many this is God but different religious have different beliefs. It is noted by Greek Historian Herodotus that Thales of Miletus predicted an Eclipse during the war that occurred between the Medians and the Lydians. Although the exact Eclipse that occurred is still uncertain it was noted that when the Eclipse happened both sides put down their weapons and declared peace. It is presumed that the Eclipse could have been the one that happened on the 28th May 585BC that happened near the Halys River in Asia Minor. Many have tried to predict exactly when Good Friday transpired assuming that the darkness described at Jesus’s Crucifixion was a solar Eclipse, however there are no conclusive results yielded. The first recorded observation of a total solar Eclipse was in France during 1706. In 1715 English Astronomer Edmund Halley observed an Eclipse on May the 3rd. The first photograph taken of a solar Eclipse was taken July 28th 1851, and in 1868 spectroscope observations taken during the solar Eclipse on August 18th helped determine the chemical composition of the Sun. This year due to the increase in solar power it is predicted that up to 34GW of power maybe temporarily decreased throughout the Eclipse particularly in Europe. Temperatures are also predicted to drop and Wind Power may decrease as the winds are reduced by 0.7m/s. A Super Moon is a combination of when either a Full or New Moon is in phase at the same time the Moon is making its closest approach to the Earth on its optical orbit. This results in a larger looking Moon although the Moon itself does not change size. The last occurrence was on September 9th 2014. According to NASA a full Moon at Perigee (the point in which the Moon is at its closest to Earth) can be up to 14% larger in area and 30% brighter that a Moon at its furthest point from the Earth. The Full Moon cycle is approximately every 411.8 days and around every 14th Full Moon there will be a Super Moon. However about halfway through the cycle the Full Moon will be close to Apogee (furthest point from the Earth) and a new Moon immediately after or before can be a Super Moon, thus up to 3 Super Moons can occur per a Full Moon Cycle. At Lunar Perigee the tidal force is at its strongest due to the combined effects of the Sun and Moon on the Earth’s oceans, the difference however is only a few inches at most. Finally the Spring Equinox, an event when the duration of day and night are approximately the same length of time, although the day is slightly longer due to the amount of time the Sun spends above and below the horizon at every location on the Earth. The term comes from the Latin aequus (equal) and Nox (night). The equinox occurs when the plane of the Earth’s equator passes the centre of the Sun, so the tilt of the Earth’s axis is neither tilting towards nor away from the Sun. Originally the Spring Equinox was the 25th of March when Julius Caesar established his calendar in 45BC. A Julian year (365.25 days) is slightly longer than the tropical year so the calendar drifted with respect to the equinox, so that each occurrences of the Equinox also drifted, by 1500 AD the date was 11th March. It was due to this drift that Pope George XIII chose to create a modern Gregorian calendar. It was designed so that Easter never happened before the Spring Equinox. He planned to move the Equinox date to 21st of March which is the original day allocated to it in the Easter table of Julian’s Calendar, however leap year intervals were not smooth and caused the equinox to oscillate by about 53 hours around its mean position. This would then raise the issue of it falling on March 22nd and thus Easter affectively occurring before the equinox. The astronomers worked out an appropriate number of days to omit from the calendar so that the equinox would swing between the 19th and 21st of March but never fall on the 22nd. There are several safe ways in which to view the Eclipse and below is a link to the BT website that offers some useful safety tips in which to watch the Eclipse. The most important is DO NOT LOOK DIRECTLY AT THE SUN!! We cannot emphasis this enough.